Names in other languages: Jaquier ou jacquier (French), Katahal, Kathal (Hindi), Pala pazham (Tamil), Chakka (Malayalam), Panasa (Telugu & Oriya), Phannasa (Gujarati), Kanthal (Bengali), Phanas (Marathi), Kathal (Punjabi & Urdu). Surely you have heard of the magnanimous jackfruit! The prickly fruit, characterized by a gasoline smell on the outside and a bubble gum aromatic flesh in inside, is the largest tree-borne fruit in the world, with a maximum weight of 36kg. Native to Southwestern India, Bangladesh, Philippines and Sri Lanka, the jackfruit is admired for its incredible taste, texture and edible seeds, similar to chestnuts, found encased in the flesh. Consumed both in the ripe and unripe forms, jackfruit is a part of some of the most exotic and lip-smacking delicacies across the world. Eaten raw, blended into a fruit salad or as a dessert topping, jackfruits do not lose their nutritional content. Botanically known as Artocarpus heterorphyllus, the jackfruit is a member of the Mulberry family. Apart from its pulpy flesh, sweet taste and amazing aroma, only a few people are aware of the wholesome benefits that it offers to the body. With the following list of advantages and tips, we promise to make your jackfruit meal a delicious and nutritious one. The exact origin of jackfruit is unknown, although it is believed to be indigenous to the rainforests of the Western Ghats of India, dating back to 3000 to 6000 years ago. Historians relate the discovery of jackfruits with the Indian Emperor, Ashoka, who encouraged the cultivation of several fruits, jackfruit being one of them. In 1782, certain plants were captured from a French ship and were taken to Jamaica and planted there. 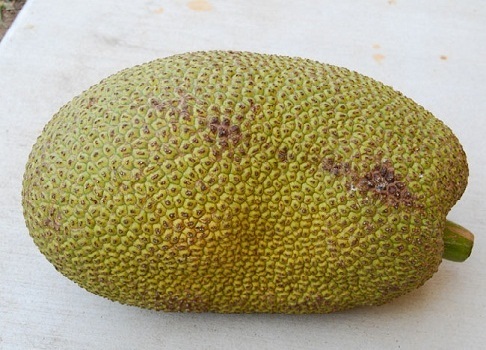 About 100 years later, the jackfruit appeared in Florida and was introduced into Brazil in the 19th century. Gradually, the fruit spread to other parts of India, Southeast Asia, East Indies and Philippines. 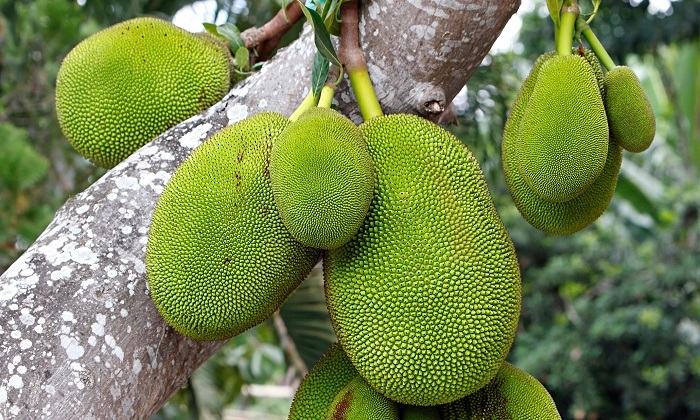 Today, the jackfruit is the national fruit of Bangladesh and Indonesia. In the Americas, it has successfully flourished in Brazil, San Diego and Florida. However, the portions of the United States and Canada experience a cold climate making it unsuitable for the growth of jackfruit trees. India, Bangladesh, Sri Lanka, Philippines, Malaysia, Thailand, and Indonesia are some of the major commercial cultivators of jackfruit. Jackfruit serves as an excellent protective agent against viral and bacterial infections due to the presence of Vitamin C in it. In addition, this fruit is known to strengthen the immune system by improving the condition of white blood cells. Enriched with phytonutrients, like lignans, isoflavones and saponins that contain anti-cancer and anti-ageing properties, jackfruits are beneficial in eliminating cancer-causing free radicals in the body and inhibiting the degeneration of cells. Owing to its anti-ulcer agents, jackfruits are known to digestive disorders. These fruits are a great source of fiber. This property helps in avoiding constipation and smoothening bowel movements. Besides, jackfruits protect against the colon mucus membrane by eradicating carcinogenic chemicals from the large intestine. Being an excellent source of vitamin A, jackfruits monitor the health of the skin and eyes, specifically by keeping vision-related problems, like macular degeneration and night blindness, at bay. With simple sugars such as fructose and sucrose present in jackfruit, it is useful in boosting energy levels, without adding fat or cholesterol to the body. Magnesium, found in large amounts in jackfruit, absorb calcium in the body and contribute to strengthening of bones and prevention of bone related disorders like osteoporosis. Jackfruits play a significant role in thyroid metabolism due to the presence of copper in their flesh, thereby promoting hormone production and absorption. The potassium content in jackfruit is useful in lowering blood pressure thus, reducing the risk of heart attack and stroke. Similar to other fruits and vegetables, jackfruit is also heart-friendly; thanks to the Vitamin B6 that reduces the levels of homocystein in the blood. Jackfruit fulfills the iron needs in the body, thereby promoting proper blood circulation and preventing cases of anemia. With anti-ageing properties, jackfruits are known to inhibit the degeneration of cells, thereby giving the consumer a younger, suppler and more glowing skin. Due to the fact that it has low calories, jackfruits also help in maintaining the body by preventing the deposition of fat and elimination of obesity. The roots of jackfruit are extremely beneficial for people suffering from asthma. A concoction prepared by boiling its roots is a good remedy for wheezing and other respiratory problems. The extract of jackfruit is known to treat various skin problems, diarrhea and fever. Jackfruit has about 94 calories per 100 gm of weight. Jackfruits with their skin intact need to be bought. Push the thorny skin of the fruit with your thumb to check its quality. A mild, yet rich, flavour will emerge. This is the perfect one. Ripe jackfruits are characterized by soft thorn-like projections unlike the unripe ones which are spiky and difficult to touch. Due to their huge size, jackfruits are generally sold in cut pieces. It is best to buy jackfruit portions from a trustworthy and hygienic vendor. Jackfruits can be stored at room temperature for three to ten days. The fruit colour deteriorates and turns brown quickly after ripening. Hence, it is advisable to refrigerate in order to preserve its texture and flavour. Frozen jackfruits can be stored for more than two months. This can be done by soaking in syrup, made from water and sugar in the ratio 1:1, and combined with citrus juice and then put in the freezer.